Longest name ever for a bow tie? Maybe. Best name ever? Definitely. Black with dove gray detailing. Adjustable. Fits well for collar sizes between 14.25" and 17.5". One size fits most. The Topographical Error (like the Blueprint and the Exhaust) has so much style it's scary. Wearing even a typical bow tie isn't for the timid, so wearing a bow tie with a print might seem pretty out there. But sometimes an idea is just crazy enough to work. This atypical, muted ivory/dove grey color scheme will make you stand out in all the right ways, and the story behind the print is compelling enough to keep 'em interested. Featuring a faithful reproduction of sea-depth measurements taken in Scandinavian and Arctic waters in the early 1900s, the design subtly points out that the depths of those waters have since increased significantly due to climate change. 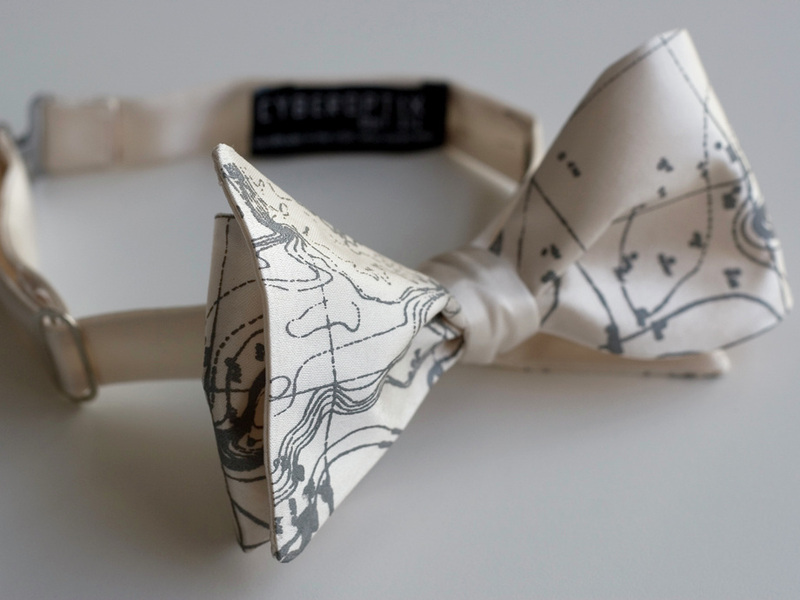 This vegan bow tie might not convince your friends to quit hurting the planet, but it might just start the conversation that does. And you'll look bold and discerning while you're at it. One last thing -- a hook in the back lets you remove the tie without undoing your knot. So, next time you want to wear it, you can quickly slip it on, hook it, and make a tweak or two in the blink of an eye.